The polls have closed, and the early results are in; it appears that the leader will have been chosen by less than 50 percent of voters. No, I’m not talking about the provincial election here in Quebec. 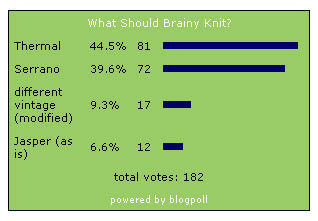 I’m talking about a minority knitting-project government ruled by the Thermal party. Just a handful of votes behind, it's looking quite certain now that Serrano will form the official opposition. And no doubt the fringe vintage candidates will be disappointed with the results, although let's be realistic: they were the underdogs, representing the well-intentioned, yet somewhat unrealistic, Green or Marxist-Leninist party of knitwear options. What's that, Peter? The official results are in? OK, let's get that graphic on the screen for the viewers. There you have it, voters. It was a close call, but we have a winner. And we have just been notified of the following brief statement released by Thermal party headquarters: "Swatching will commence in the days to come. Thank you." I love it when my candidate wins. A good choice, I think. I'm poking around trying to find that vintage knitting book for myself now. Well... I didn't vote, but I think Thermal is a great knit, enough to keep you interested without demanding too much attention and a versatile end product :) I'm certainly having fun with mine. Enjoy! Our only hope now is for a vote of non confidence to force another election in the fall. close, but I think the best sweater won!